Il sito Internet dei Traduttori siriani liberi (al-Mutarjimūn al-suriyyūn al-ahrār, المترجمون السوريون الأحرار) ha recentemente pubblicato l’articolo di un uomo di religione cristiano siriano che analizza i diversi atteggiamenti dei cristiani nei confronti della rivoluzione in Siria. L’autore ha preferito non rendere pubblico il suo nome per evitare possibili ritorsioni e intimidazioni. Proponiamo qui di seguito la traduzione in inglese e i link all’originale in arabo e alla versione francese dell’articolo. […] Statistics estimated the Syrian Christians to be between 5-10% of the population, divided into several churches: Eastern Orthodox, the majority, Eastern Catholic and limited numbers of Latin and Anglican churches. The majority of the Christians back the current regime in spite of what has taken place and is currently taking place. Only a minority of Christians stand on the other side and support the rebels in their demands and take part in their struggle especially the peaceful one. Those who support the regime have different motives. Some have Islam-phobia – Islam here is exclusively the Sunni Islam . Others, mainly the youth, have been brought up and their awareness of their country was formed while Bashar Al Assad was in power. They were impressed by the image in which this president was presented: young, modern, open-minded, studied in the west, has a beautiful and active wife, etc. The attitude of this group of Christians was a result of their ignorance of the true history of Syria. The history that has been taught to them in schools and universities through official curricula, shows that the history of Syria has almost started with Al Baath party and Al Assad family. Moreover, there are Christian supporters, mainly businessmen who back the regime for financial benefits. Finally, part of the group known as ‘greyish’ or ‘sitting-on-the-fence’ that includes a considerable number of intellectual Christians who declare their neutrality in the current struggle as they cannot justify the brutality of regime’s actions, but at the same time, they secretly support it for different reasons, some of which are stated above. On the other hand, there is a minority of Christians who stand with the uprising against the regime. Most of them have never been known as being politically organised or committed. They are generally educated people and most of them are seculars. Moreover, a good number of them do not hide being atheists or agnostics, though they are considered ‘socially’ Christians. Regime supporters, including Christians, have fought and are fighting a war of words on the ground and on the social networks against the opposition in general and Christian opposition in particular. In many cases direct personal threats to the opposition are expressed. That even developed, partially, to taking active part with ‘Shabeeha’ (armed or semi-armed militias) acts, using excessive and severe power to suppress the demonstrations of the opposition. Moreover, there are authentic reports that Christian businessmen have participated in the financial support of the regime thru funding the crackdown. On the other hand, the part of the Christians opposing the regime support the uprising in the media and in some organisation efforts. They also provide humanitarian supplies to the rebels and the residents of the destroyed areas. This does not mean that they do not participate in the demonstration. However, it is noted that there is no supported reports that Christians have participated in armed struggle or joined the Free Syrian Army. The Position of the Clergy – The attitude of the clergy, in general, has changed from waiting and confusion to the apparent public support of the regime’s strategy, including the violent suppression of the opposition movement. Yes, there are very limited, humble and shy positions that declare their neutrality and that Christians are not involved with any particular regime. This can be interpreted as a hidden opposition to the practices of Al Assad regime. Anyhow, these recent positions have been met with insignificant response. It is fair to say that the majority of the clergy, both official and personal, support the regime up to this moment. This is based on their belief that the current regime protects them from the Muslim majority; consequently it ensures the interests of the Christians. The position of the church, however, must be based on spiritual, Christian and biblical principles, and not on interests. The huge number of early Christians, during the first three centuries , have rushed to face martyrdom in their struggle against the suppression of their religion. In doing this, they have listened to the voice of their Christian belief, not to the voice of interest, even though their belief has lead them to death. 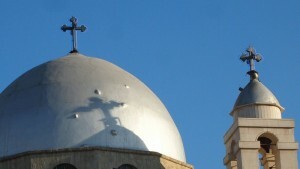 This extreme loyalty and support of the dictatorial regime by the Syrian clergy and Christians is accompanied by a striking phenomenon: increasing calls by Christians to reject sectarianism, and repeated narration of long, old, historical good relations with the Muslims, under slogans such as ‘We and You are ONE’. Meanwhile, it is noted that these same loyal and supporting Christians, who promote rosy relations with Muslim fellow-citizens, amazingly, fight the opposition for their fear of the same Muslim fellow-citizens, in a way similar to dissimulation. * This logic degrades the members of this minority as human beings, and categorizes us, the Christians, among ‘non-human’. Role is good to justify things and animals, not humans. Man keeps his car as long as it serves him and once it becomes a burden he gets rid of it. Similarly, once the cow becomes old, and its udder is dry, the farmer immediately gets rid of it in a way or another. * Man has standards other than those that apply to things and animals. The existence of Man, not his role, is the mere justification of his existence. And this is the specific point of the birth of human civilizations and ethics. Otherwise, why do we provide and support the frail and the ones with special needs? Man gets his importance from the image of God in him. Any violation of human rights is attacking God through His image. Your Excellency, President Bashar Al Assad: We are with you in this critical crisis that our beloved Syria goes through and bleeds because of those who sabotage and terrorise it. Unfortunately, they are its children who have sold their country and conscience. Dear Sir, we do not ask for presidency, but we hold up our hopes of your brotherly sympathy and compassion, which you used to, still, and will continue to show to us. We beg you, Your Excellency, the President. Eastern Church, both Catholic and Orthodox suffer from a crisis for a long time. The immigration of Christians has been going on for a long time and draining their population (in the region). There are various reasons behind such emigrations. Some are related to a chronic and mutual misunderstanding with Muslims due to obstinate and negative understanding of Islam, others to an apparent crisis of the Islamic discourse towards minorities in the East. The official Church has not played a compromising, open-minded and mature role between the Christians and Muslims, with the exception of very rare cases. This has contributed to the accumulation of little, but repeated, small factors and incidents in the Christian memory. Moreover, the Christian community has not witnessed any serious revision of the Christian-Islamic relation except for rare efforts of few elites who have, naturally, limited effect, not to mention that they are self-confined. It is worth mentioning here that Syria has not witnessed any sectarian Christian-Islamic crisis, in the full sense of the word, since the incidents of 1860, i.e. about a century and a half ago. This painful crisis, however, originally started in Lebanon, between the Druze and the Maronite, and expanded later to Damascus to involve Sunni Muslims and Christians. Aleppo had witnessed a similar crisis ten years earlier, in 1850. The Ottoman government had its role, in one way or another, in triggering this crisis. The incidents lasted for only few days. The emigration of Christians was accompanied with the retreat of their cultural level and their enlightening role. One of the reasons of such emigration and the retreat is what Syria witnessed under the rule of Al Baath Party during the second half of sixties of the last century, namely the nationalisation and appropriation of private agricultural lands, factories and schools for the cause of socialism and other reasons. After the nationalisation, without neglecting the role other previous causes various elite Christians emigrated affecting the nature of Christian existance in Syria. The culture of those who stayed retreated as a result of the education policies applied by the regime, an apparent manifestation of dictatorship: spreading ignorance among people and the exiling of the elites to make the control process easier and ensure staying in power. The Eastern Church, rotted with corruption, was not of course, spared from the intervention and harassment of security and intelligence agents, which made those who stood fast against the rising totalitarian stream withdraw into themselves. Gradually, the Church became, in one way or another, similar to the regime in favouritism, corruption and poor quality. ‘Stockholm Syndrome’ (where the victim sympathises with the ‘executioner’, who caused his suffering, and starts protecting and defending him) could be one of the reasons behind the striking hold-on of the Syrian Christians to the regime whose malpractices of power had great effect on their situation. Moreover, Christians in Syria have apparently been affected, unconsciously, by the status of the Christians in Lebanon and with the sorrows and damages of the civil war, the Christians in Egypt and the emigration of those in Iraq. An effect that pushed them to be very cautious and even to directly reject any political change and publically adopt the saying: ‘stability at the expense of freedom’!! It could be because of the totalitarianism of the Syrian regime that we see the Christians are not interested in public affairs. They are generally not interested in, nor participating in any issue unless it directly involves them as Christians. So, instead of calling and struggling for a citizenship equality that provides fairness and protects them they preferred, under Al Assad’s rule, to be a confined group, trying to maintain its existence and interests. This preference went to the extreme in some cases. What also caused this extreme Christian attitude in the current Syrian crisis is the weakness, dispersion and disability of the Syrian opposition, due to a half-century of suppression and the absence of real political activities in the country. To conclude the reasons behind the support of the majority of the Christians to the dictatorial regime in Syria, one can say that there is a deep fear of the others, Muslims, which the Christians themselves participated in creating it; accompanied, or may come first, by racism and superiority that are sometimes apparent and hidden in others. They look to a Muslim citizen as of a lower civilized class. The roots of this racism may go back to the era when the Christians in Syria were ahead, in scientific, cultural and financial fields and which for objective reasons have faded by time especially during Al Baath ruling era as mentioned above. So, superiority has gone and the elites have decreased in number to leave behind the baseless feeling of both. Another reason for the support of the regime is attributed to a psychological state seen on groups who go through dictatorship. The Syrian people have gone through the above-mentioned ‘Stockholm Syndrome’ as the result of suppression and spreading of ignorance. It should be noted that all Syrian citizens who are 65-year old and younger had not seen, since they were 16, any party other than Al Baath as they only ruling party; and all who are 58-year old and younger had not seen any family other than Al Assad in the Presidential Palace since they turned adults. Summary and a Plea – The position of the Syrian Christians is regrettable and painful. It contradicts the true Christian spirituality, which we have learnt from the Bible and in several historic milestones. This attitude may indicate the approaching death of Christian existence in this Eastern region. Though the emotional and personal feelings have almost prevailed, with a lot of efforts required by an objective and rational judgment, based on the available and projected data, one can say that the fall of Bashar Al Assad is imminent. It is a matter of time. Time is the current Syrian situation, however, means more bloodshed, death and all the negative effects that the civilians will go through. No sane person can imagine that the first few governments, after the fall-out of Al Assad regime will be perfect or widely approved by people. This phase will be the first step on the road to establishing a democratic, modern and civil state that respects human rights. This coming phase will witness a deep quake of the church – a quake that we hope will be a start of a comprehensive Christian resurrection that makes the Christians aware of their values, role, and true position as citizens, not as a community. The Sunni branch of Islam is the religion of the majority (approximately 70%) of Syrians. Up till the Edict of Milan issued by Emperor Constantine the Great around 313 AD. Una terza via per i cristiani di Siria?